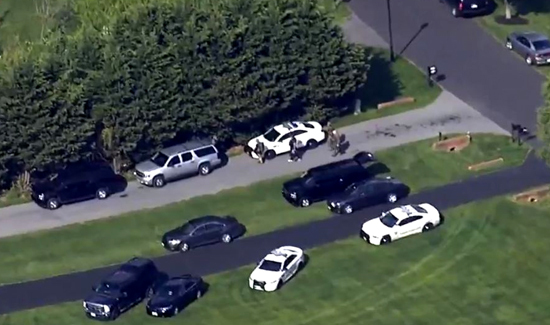 A man suspected of shooting and killing three people in Montgomery County fatally shot himself after a hours-long standoff with police. The slaughter may have began when the man’s wife fled their home to get help from a neighbor, investigators say. Christopher Wilson Snyder, 41, died from a self-inflicted gunshot wound, police said. A standoff between police and Snyder lasted for hours Monday as Snyder refused to leave his home before a SWAT team vehicle rammed the door. Snyder’s wife told police the incident began after she ran out of her home after being held there over the weekend. She said she ran to the neighbor’s house for help, and police say Snyder followed. Snyder began shooting at 22002 Brown Farm Way, a home with at least six people inside, Montgomery County Police Chief J. Thomas Manger said. Three people were shot and killed. One lived at the home, one was a guest from out of town and another worked at the home, Manger said. Three other people, including Snyder’s wife, were able to escape, Manger said. Several people called 911.